Ok race fans hold onto your pants, here comes the Guru with all the results and goings on trackside. Friday night sore the running of our new sprint car race format which really sorts the men from the boys, or though Ricky Biner still managed to get through. With 14 Sprinters,5 Late models ,5 Sc18s & 5 Modifieds it was another big night of thrills and spills. Jake brien took the late model a main from Jason myers & Clinton madsen,and also won the Sc18s with Musso man 2nd & Clinton madsen third again. Guru smashed them in modifieds with a massive win over Scuba Steve & numbers man Tim. Then it was time for the ground to shake as the sprinters hit the track for there finals,after the new format had sorted the quality field into A,B,C and then narrowed it further the A main was set to be close. Then line up was impressive with only one exception as mentioned earlier ;D.Donny Burke,Jason Myers,Ricky Biner,Guru Saldana&Simon Bestman would contest the feature. With the track slick and slippery the race started slowly and Ricky Biner took the early lead from Donny Burke & Jason Myers a crash in turn 3 between Guru & simon would have a lasting effect on there race. The rock crawling track is under construction and should be up and running very soon. The hobby shop is going well and has all the goodies you want at great prices just see mitch and steve. :)Well race fans its that time of the week so get your backside trackside. On the news front Donny Burke of John Mcenroe motor sports is fit and well and will be racing tonight. We also have a new timing system which will make racing even better with the inclusion of a second monitor at the entry to the pits. A great night at oversteer with sprint cars ,late models & SC18s. Ricky burner won the sc18 class followed closely by Jake the snake and racin Jason in 3rd. Racin Jason won the latemodel feature followed by jake the snake & billy ray in 3rd. Scuba Steve & Racin Jason were doing battle as Guru closed the gap and started to make his move with car on fire and again setting quick time . Racin Jason was out on lap 21 with mechanical issues and scuba Steve was only running on 5 cells so this left Donny & Guru to display some the best racing this season . Donny taking the win from Guru, Scuba Steve and Racin Jason ,Ricky Burner DNF. Well the first round of the oversteer track championship was simply awesome with a great feild of sprintcars and latemodels doing battle for those precious points. The late model feature was frantic with constant position changes and some hairy moves for the lead.Racin Jason in the Guru engineering car was in blistering form and hot on his heels was Clinton madsen & Bobby Ray. Meanwhile the race was on for the minor placings Musso and DefKiss racing hard and fast . The final results were Racin Jasson 1st on 100 points.Clinto Madsen 2nd on 99 points.Bobby Ray 3rd on 98 points.Musso 4th on 97 points & DefKiss 5th on 96 points.A great first championship final. Next up was the sprintcars and with such a good field it was always going to be a fight to get into the 5 position A main.Eventually the field was set with pole going to Donny Burke followed by Ricky Burner , Clinton Madsen ,Racin Jason & Guru. The start was clean and sore Donny in the lead with Ricky and Guru chasing hard . a few laps down and with Guru applying the pressure Ricky ran wide and Guru seized the chance to take 2nd and start to close the gap. Racin Jason and Clinyton Madsen were starting to find there rhythm as Ricky pulled off with car issues,Donny was on fire and was 2 laps ahead on lap 70.Guru was starting to close the gap with some very quick laps 3.60 being his quickest and would help him bring the gap to just 3.7 seconds between him and Burke .The fastest lap of the race was set by Clinton Madsen a 3.57 the quickest time ever set in a feature race and close to the record held by Racin Jason of 3.54. Racin Jason moved into a comfortable 3rd place and thats were he would stay with a great display of consistent laps. The final placings were Donny Burke 1st on 100 points,Guru Saldana 2nd on 99 points, Racin Jason 3rd on 98 points,Clinton Madsen 4th on 97 points, Ricky Burner 5th on 96 points.A great night was had by all and a big thanks to jason and mitch . Round 2 next sat and it will be bigger and better . Well race fans what a night of racing it was sprintcars and late models were fast and furious . The late models sore some great close racing in the heats with all buying for a place in the feature. The final sore Clinton Madsen,Racin Jason,Ricky Burner & Peter Kinser take to the track in what would be one of the greatest latemodel finals ever at oversteer. Ricky took the early lead from Madsen with Racin Jason closely behind.Peter Kinser retired early with engine issues leaving the trio to do battle. After a few more laps Ricky couldnt keep up the pace and was passed by Madsen & Racin Jason where the lead would change more than 15 times in 35 laps with Madsen taking the win . Sprintcars hit the track with an allstar line up,Donny Burke,Ricky Burner,Racin Jason,Peter Kinser & Guru Saldana. The race got off to a slow start with the track slick and slippery and Racin Jason taking the lead and the rest settling down to a race pace the track would allow. Kinser was out with mechanical issues and Ricky Burner was soon to follow after coming together with Racin Jason no malice intended. Burke now in the lead with Guru hot on his heels and closing the gap,it looked like Burkes rain at the top was under threat until Guru dropped a cylinder in the closing stages . Burke took the win again from Guru. 2 rounds will be dropped at the end of the championship. Race fans it was on for young and old last night with round 1 of the friday night comp. Sprintcars ,latemodels & wingless sprints filled the grids.The racing was fierce and highly competitive. The first ever run wingless sprint race was seriously cool with Simon Madsen and Donny Burke dicing almost every lap until finally Madsen crossed the line in front taking a well earned win. Latemodel were up next and the race was as close as first predicted. Racin jason was on fire and took a commanding lead from the start leaving Musso Man and Ricky Burner to fight it out.As the race progressed Ricky made his presence known to the rear bumper of Racin Jasons machine and eventually took the lead and the win. Then it was time for the main event and with an impressive field of 6 cars for the first time it was on. Ricky Burner took the early lead but not for long as Guru coming from position 6 was on blistering pace setting race record lap of 3.46 however he was taken out by Scuba Steve >:(and then a few laps later by Racin Jason . Donny Burke was slowly making his way up front followed by Racin Jason ,Guru and Ricky both out with mechanical issues?left 4 cars racing for the win. Donny Burke winning with Racin Jason 2nd & ScubA Steve 3rd. Hello race fans what a massive night last night for round 3 of the track championship. With 4 classes contested sprintcars,latemodel,modified & sc18 trucks. 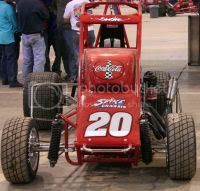 We also ran a non championship wingless sprintcar race. The racing was awesome in all classes as drivers get better every week the racing is getting better also. The little sc18 trucks are fantastic to watch and can also be run as a latemodel with a simple body swap. This has been a popular option for alot of drivers as they are on special from our shop for only $199 or $240 with a pre painted latemodel body. Now to the races, sc18 was won by Ricky Burner followed by Racin Jason 2nd,Clinton Madsen 3rd,MussoMan 4th,Scuba Steve 5th. Modified was a very close race with heaps of passing and big hits,the winner was Racin Jason follwed by Guru 2nd, Scuba Steve 3rd, Ricky Burner 4th, Brendon Smith 5th. The latemodel race was awesome Clinton Madsen taking the early lead with Ricky Burner in 2nd and Racin Jason 3rd. Donny Burke & Guru both running the losi 2wd latemodels were starting to make there way through the field but it wasnt with out its moments,the larger cars causing some carnage much to the dismay of the other drivers . The final results all be it controversial were 1st Donny Burke,2nd Clinton Madsen 3rd Musso Man 4th Racin Jason 5th Ricky Burner 6th Guru 7th Scuba Steve 8th Tee Bone. The sprint car main event was a sizzler with the best of the night set to do battle. A special mention has to go to our first female A finalist,4ft nothing pocket rocket Tee Bone aka Tee Lynch well done. With race underway and the track fast with ample grip the cars were on record pace. Donny Burke was the early leader and doing battle with Clinton Madsen while Tee Bone held 3rd over Racin Jason. Gurus Car was screaming setting a new track record of 3.38 sec but this was a downfall, Guru drove poorly unable to put consistent laps together and also running up the back of fellow competitors. Half way through Donny Burke had put all a lap down with steady driving,Racin Jason was in 2nd and Tee Bone put the move on Madsen for 3rd. Donny Burke winning again with Racin Jason 2nd Tee Bone a very impressive 3rd,Guru Saldana 4th & Clinton Madsen 5th. :)Well race fans tonight is shaping up as one of the biggest yet with the 100 lap Latemodel feature and a big field of Short course trucks heading to oversteer. With the track championship heating up and round 4 on tonight who will win the features,can Donny Burke claim 4 in a row or will it be a new face? The doors are open at 11am for practice and fun then racing gets underway at 6pm. Its the perfect time to come down for your first look ,or join in the fun. Being an indoor track means you wont get wet. A big night was had last night with sprintcars,latemodels & short course being contested. The short course trucks were one of the highlights of the night with some close racing and some great spills. Ricky Burner was on fire taking an early lead from Racin Jason and Clinton madsen who was under fire from Tee Bone. After a few laps the Burner went off the boil and Racin Jason would inherit the lead which would change lap after lap between him Ricky & Madsen with Tee Bone just waiting to pounce. Latemodel was awesome the track was slick and slippery and with a fast start it was going to be a race of attrition. Racin Jason was a again in the lead with Madsen chasing him down & Musso Man hot on his heels . There was alot of argy bargy as the jostled for position and a the surprise mover and shaker was Tax man Tim who would hold out Musso Man for 2nd place . On to the race once again Ricky burner took the early lead but after just 2 laps King Donny let his presence be known. Ricky and Racin Jason would dice for the 2nd spot lap after lap until once again the Burner hoodoo would strike with a steering failure taking Ricky out. The 4ft nothing pocket rocket Tee Bone was again in the Amain and chasing hard after Clinton Madsen who after a slow start was slowly edging closer to Racin Jason . The race for the lead was close with Racin Jason trying everything to get get King Donny but just couldnt do it [Karma] . So it was a great night again with heaps of hot food consumed and a great time had by all .Big thanks to jason . See you all next friday and saturday. Well race fans round 5 was a magic round with some seriously good racing in all the divisions.Sprintcars, latemodel & short course. It was on for young and old in the short course trucks with Donny Burke taking and early lead and Racin Jason in hot pursuit,Clinton Madsen had a slow start and was troubled by new comer Travis Pastrana who was on fire in his debut race. There were thrills spills crashes shunts and punts galore but there could only be one winner Donny Burke 1st Racin Jason 2nd Travis Pastrana 3rd Clinton Madsen 4th Musso Man 5th Ricky Burner 6th. Late model sore the return of Guru saldana racing for Tee Bone motor sports and the race was simply spectacular,Guru was on fire and in the lead after only 3 laps with Racin Jason trying everything to stay in touch.Tax man Tim was flying and holding onto 3rd with ease,Defkiss was also driving well with some consistent laps and good passing. Clinton Madsen was in a spare car and starting to make a move on Tax man Tim with 15 laps to go but for Racin Jason it was all to late Guru was 6 laps ahead and there was no stopping him. 1st Guru 2nd Racin Jason 3rd Clinton Madsen 4th Tax man Tim 5th Defkiss 6th Ricky Burner dns. Sprintcars were up next and with Tee Bone making her 3rd Amain in a row it was any ones race. The start was slower than normal and Donny Burke was in the lead with Racin Jason in 2nd Billy Ray 3rd in his first Amain .Racin Jason pulled to the infield with electrical issues and Tee Bone took 2nd spot from Billy Ray who was soon under fire from Clinton Madsen. Donny had a commanding lead and was never challenged but the minor placings were swapped constantly until the cracks started to appear.1st Donny Burke 2nd Tee Bone 3rd Racin Jason 4th Billy Ray 5th Clinton Madsen. So another great night of racing and we will be back next saturday night for round 6 . WooHoo what a night of racing with upsets galore and a special mention to Travs daughter for being the checkered flag girl. Onto the racing and with the running of the first big block latemodels it was awesome they are so good to drive and the racing was very close. Clinton madsen was the man to beat setting a cracking pace from the outset. Racing Jason was finding his rhythm in the middle section of the race as things started to heat up.Defkiss was on fire and really putting the challenge down. Guru Saldana was starting to close the gap on Madsen and with only 1 lap to go tragedy would strike with Madsen getting a big hit from Defkiss switching his car off and giving the win to Guru. Mini latemodels were up next and with Guru wining 2 out of 3 heats the others were after him. The start was clean and Madsen was in the lead followed by Racin Jason and Guru,Defkiss and Tax man Tim were doing battle constantly swapping positions. Back up front Guru had taken the lead only to have engine issues that would later also strike Racin Jason leaving Madsen to cruz to victory lane. 1st Clinton Madsen 100pts 2nd Tax man Tim 99pts 3rd Defkiss 98pts 4th Guru 97 pts 5th Racin Jason 96pts. The main event was electric the sprintcars were on the dummy grid and primed for action Burke was the early leader but the rest of the field was not letting him get away.Guru was having trouble staying with pack his car was to tight,Racing Jason made a beautiful move to take the lead and with consistent fault free driving was able to stretch the lead putting Donny Burke a lap down and taking an easy win. 1st Racin Jason 100pts 2nd Donny Burke 99pts 3rd Clinton Madsen 98pts 4th Guru 97 pts 5th Billy Ray 96pts . So another great night see you all next friday and saturday for more racing action. Sorry for being late with the race reports race fans Gurus real car decided it wanted to stop going lol. Well it was a big night again with some very clean driving and some serious action. First up was the late model Amain and what a start for Clinton Madsen ,Guru and Racin Jason it was fast and clean all within half a metre of each other. Tax Man Tim was on fire setting a very fast lap 3.38 sec and Peter Kinser was also quick and hot on his heals. Guru made a move on Madsen whos tires were now starting to go off and started to make a handy gap over the field,but Racin Jason had other ideas with a blistering run late in the race he passed guru with only a handful of laps to spare to take the win. The sprintcars hit the track for the main event and it didnt take long for the action to start with Donny Burke hot on the heels of Racin Jason. Guru had made some pre race changes which were having a negative effect on the car and the race causing some very hairy moments for the other drivers. Donny Pulled a slide job on Racin Jason and made it stick .Madsen and Guru were left to do battle with Billy Ray while Burke took the win . Well race fans it was a great night of racing even with numbers down due to the holidays. With a few breakages in the late model and short course heats making finals impossible to run it was up to the ever popular sprintcars to put on a show ,and boy did they. The line up couldn`t get any better with the top 5 qualifiers ready it was it was king Donny Burke taking an early lead followed by Clinton Madsen and Racin Jason.With lap times quicker than any previous race held it was awesome to see. The race had a new format with cautions being called when cars had crashed ,meaning all drivers would stop where they were which made for very clean racing but a slower overall race time. Donny Burke was still in the lead but the man on the move was Guru whos car was blistering quick as he pulled up behind Racin Jason and Burke on turn 2 and passed both on the outside to take the lead . Racin Jason was having handling issues but was still quick,Tee Bone had pulled to the infield and was out. Clinton Madsen was showing what sportsman ship was all about letting the lead cars through and still putting respectable lap times down. With 35 laps to go Guru hit the dislodged fuel tank of Racin Jason putting him into the turn 3 wall and giving the lead to Donny Burke. Nearly a lap down Guru was on a charge and taking time of Donny every lap and on the final lap the difference was only 2m from 1st to 2nd and was one of the closest finals seen at oversteer. 1st Donny Burke 100pts 2nd Guru 99pts 3rd Racin Jason 98pts 4th Clinton Madsen 5th Tee Bone 97pts. A very special thanks to our SUPER marshals Kourtnee & khloee thank you girls you were awesome.